" Socialization is to realize a good government organization. That is civil state apparatus that is reliable and professional in executing the task"
As many as 120 civil servants underwent socialization about rules for civil servants held by East Jakarta Administration. "Socialization is to realize a good government organization. 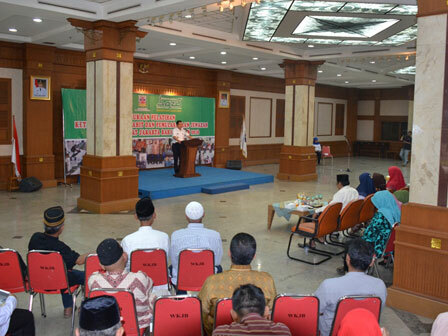 That is civil state apparatus that is reliable and professional in executing the task," said Bambang Musyawardana, East Jakarta Mayor while opening the socialization, Wednesday (9/14). Socialization materials are more to Presidential Regulation No. 53/2010 on Discipline of PNS. Law No. 5/2014 on State Civil Apparatus (ASN), Presidential Regulation No. 10/1983 Jo Presidential Regulation No. 45/1990 on permission of Marriage and Divorce for PNS. It is also discussion on regulations that set ethic code, leave, employee card, marriage couple card for PNS. He hoped, such socialization could produce understanding about law regulation in term of employment. And PNS understands every problem and can solve it. Additionally, understand about marriage licenses, divorce and leave for PNS.